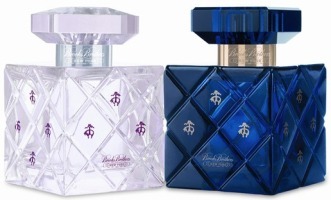 Brooks Brothers is launching a new fragrance duo in November, including their first women's scent since the 1950s. Brooks Brothers New York for Ladies ~ features notes of orange blossom, bergamot, dewy greens, pear blossom, tuberose, hyacinth, freesia, jasmine, orris, musk, soft woods and rosewood. Developed by perfumer Ilias Ermenidis; available in Eau de Parfum. Brooks Brothers New York for Gentlemen ~ with notes of bergamot, verbena, petitgrain, mandarin, carnation, orris absolute, dewy greens, basil, thyme, oakmoss, vetiver and musk. By perfumer Richard Herpin; in Eau de Toilette concentration. For Gentlemen actually sounds nice, only throw out the thyme. I tell you, I've been disappointed w/ the latest crop of men's scents. Still have a lot to try, but of the ones I did try, Pi Neo didn't exactly thrill me and Emporio Diamonds burnt my nose hairs w/ its synth sharpness. Looking forward to the Guerlain and am finally buying that bottle of Essenza del Tempo. Today. Love those bottles:)) Gentleman's fragrance sounds nice. Neither of them are grabbing me, but usually end up liking men's better. I'll have to see if I can find these at my local BB store. I think they resemble the Chopard Madness bottle. A little. Being a floral girl the women's sounds intriguing, if it isn't too light. What do you think the price range is? I don't have a Brooks Brothers here. The Bottles (Sans Quilting Effect) are Dead Ringers for the Lauren By Ralph Lauren bottle! These Fragrances sound Quite Lovely. Very Sophiticated and Classic, Very Much like Brooks Brothers clothing and Heritage! Look forward to sniffing them! Not what I was thinking of…but obviously there are lots of similar bottles! Hey — that's it, that is what was in the back of my head. Thanks. The smaller sized women's will be $65 — not too terrible. The Emporio Armani Diamonds screeches, doesn't it? Oh yeah, it really comes very close to being downright obnoxious. Will my nose hairs ever grow back, LOL? Tried it yesterday, and it should come with a warning label not to smell the blotter right away. Ayayay! Armani should issue a biohazard alert for Diamonds, shouldn't they? LOL!